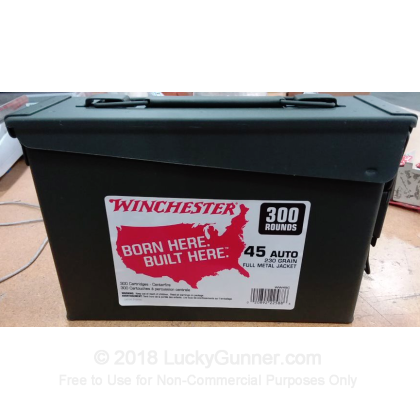 These 300 45 ACP cartridges come neatly piled in a high quality steel ammo can. The can seals tightly to protect its contents from contaminants such as dust and moisture, and is durable enough to withstand being dropped from all reasonable distances. (Just don’t drop a full one on your toe while you’re wearing sneakers -- a little pro shooter tip for you, right there.) This can’s walls, cover, hinge, and latch are all sturdy enough to endure years of heavy use, making it an investment that will long outlast the ammunition that comes inside of it. Which isn’t, to say, that this can’s ammo is anything less than what you ought to expect of Winchester. These 45 ACP rounds feature 230 grain bullets with full metal jackets, so they’ll function positively, penetrate targets reliably, and keep your pistol firing accurately as they prevent lead fouling. The cartridges’ strong new production brass casings assure reliable feeding, and along with their non-corrosive Boxer primers are optimal for handloading. And once you have reloaded them, you’ll know exactly where to store them! Q: Are these large or small primed? A: Hi Gizmo These Winchester rounds use the large pistol primers.